Originating in the defunct WHA as the New England Whalers in 1971, the club relocated to Carolina in 1997, with the Hurricanes quite popular despite their southern locale. We have a large Calgary Flames banner that presumably saw active duty each and every time the Canadian club visited PNC Arena in Raleigh to play the Hurricanes. 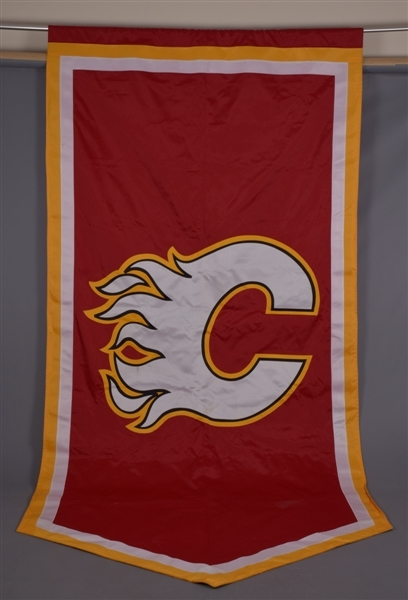 At a massive 59” x 121” and appearing to be vinyl, the thick banner feature’s quality construction, with a large layered Flames team crest along with accent striping in Flames’ colours. A label from the All Canadian Emblem Corporation with “Made in Winnipeg” remains affixed, with a few heavy fold lines present from storage, with no obtrusive wear or damage.